Have you ever asked for red tea, but ended up with a black tea instead? While the color of the two brewed teas is similar, there's probably a good reason for the misunderstanding. This is because the type of red tea you're served is going to depend on where you are in the world. The term "red tea" has two very different meanings. In many parts of the world, it is used to describe rooibos tea. Yet, it is also the traditional name for black tea in countries like China. This dual meaning can cause confusion among people who drink one type of red tea or the other. In the West, the more common meaning for red tea is rooibos (roy-BOSS), which is actually a type of tisane or herbal infusion. 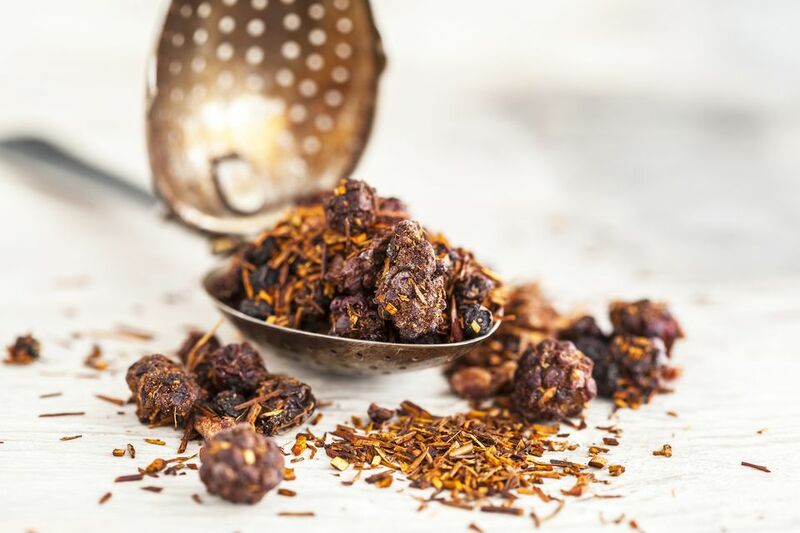 Rooibos tea comes from the Aspalathus linearis plant, which is also known as the red bush. This plant is native to South Africa and has green, needle-like leaves that get their signature red color after fermentation. Rooibos tea is red in color and has a sweet, woodsy, earthy flavor that some say is similar to black tea. Most rooibos is oxidized, though unoxidized (or green rooibos) is also available. Rooibos is naturally caffeine-free because it is an herbal tea. Due to its sweet flavor, rooibos is used in many masala chai blends. The flavor of rooibos is also perfect for dessert teas. It is often combined with chocolate, vanilla, caramel, and fruit flavors. Rooibos is also known for a number of health benefits. Not only is it low in tannins and caffeine-free, but rooibos is thought to calm you down, help with insomnia, and boost your immune system. It has long been used to ease stomach cramps and treat colic in babies as well as hayfever and other allergies. Some rooibos believers also think that it can slow down aging, though you'll have to apply it directly to your skin to find that out. There is a much older meaning for red tea, one that originated in China several hundred years ago. It is synonymous with what people in the West call black tea. Hong cha, or "red tea," is the original name for "black tea" (hei cha). This term is used in the East because, in China, teas are sometimes named for the color of their infusions. While black/red tea does have dark leaves that are nearly black, they produce a much lighter, much more red infusion. In the West, teas are often named for the color of their leaves, and so black tea leaves refer to black tea. In the cases of white tea and green tea, the color of the leaves and the color of the infusion is fairly similar, so the names are the same. In Chinese tea terminology, black tea (hei cha) is a completely different type of tea whose processing is characterized by fermentation rather than oxidation. This is also known as "fermented tea" or "dark tea" and there are three basic styles: Xiao Zhong black tea, Gongfu black tea, and Broken black tea. Black/red teas are noted for their bold flavors, which may be tannic, earthy, sweet, woodsy, floral, fruity, or chocolatey. Because of these bold flavors, black teas pair well with many foods. and they are a popular choice for afternoon tea.